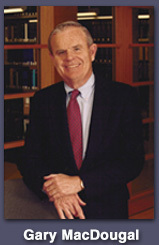 Gary MacDougal served as CEO of a Fortune 1000 company for 17 years, was a partner of McKinsey & Company, served as General Director of the New York City Ballet and was Chairman of the Illinois Republican Party. He was also Assistant Campaign Manager and Senior Advisor in the ’88 Bush campaign and was appointed by the President to serve as a U.S. delegate to the United Nations. He is Founder and a Director of the $400 million America for Bulgaria Foundation, Advisory Director of Saratoga Partners LLC, an advisor to governors on state human services reform and a writer and speaker on government reform and personal development. "In this interesting book, Gary MacDougal goes well beyond analysis and theory. His story takes you directly to the people and communities involved, and it actually provides practical answers to some of our most difficult welfare problems. The whole country can learn from this timely and engaging new book." William Julius Wilson, Harvard University "
At UPS we’ve been lucky to hire sixty thousand former welfare recipients and we’re a better company because of them. 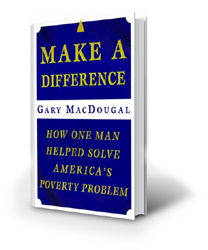 'Make a Difference' is a lively, example-filled story that shows how this works—a fascinating read for anyone." True inspiration and must read for the upcoming election. He did make a difference! "Chicago’s Violence and Its Leadership Deficit"
"Obama Should Make Saving Chicago His Pet Project"
"The 'Labor Secretary' Needs a Promotion"
"A Republican War on Poverty"
"The Wrong Way to Help the Poor"
"Illinois Offers Blueprint of How Welfare Reform Should Work"
"Welfare reform: government that works"
"Let's Not Risk a Welfare 'Fix'"
"Important Ray of Hope in Reforming Welfare"
"The Missing Half of the Welfare Debate"
"A Better Way for Children in Need"
"Chicago Violence - Jeff Berkowitz Interview"
"Make a Difference - A Speech On The Fight Against Poverty"
"You can have it all!" "2015 Welfare Reform Report Card"
"Strange Justice - The Selling of Clarence Thomas"